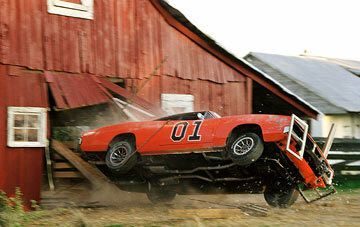 Of all the film adaptations of television shows, The Dukes of Hazzard is probably the worst. That's saying a lot, given how bad these adaptations can be. The problem is that the filmmakers can up with the idea (hey, let's make a big screen production of The Dukes of Hazzard) and spent so much time focusing on the elements of the elements that make up the Dukes mythos that they forgot to come up with a coherent story. Instead, this movie is a series of clips strung together by a story that's barely there. Boss Hogg (Burt Reynolds, The Longest Yard, Without a Paddle) is scheming to turn Hazzard into a mining pit. Of course, cousins Bo (Seann William Scott, The Rundown, American Wedding) and Luke (Johnny Knoxville, Lords of Dogtown, A Dirty Shame) Duke are the only ones that can stop him. The casting is okay. Unfortunately, Scott and Knoxville do not have the charisma to hold a commanding screen presence. All they do is speak with Southern accents and act like the good ol' boys they are. Jessica Simpson was cast for one thing (well, two things) and barely registers. Reynolds and Willie Nelson (The Big Bounce, The Journeyman ) are better, but are not on screen long enough to make any sort of impression. Instead, director Jay Chandrasekhar (Club Dread, Super Troopers) and screenwriter John O'Brien (Starsky & Hutch, Cradle 2 to Grave) throw in lots of random car chases and T&A. Chandrasekhar is a member of the Broken Lizard comedy troupe, and their style of humor (potty humor and T&A) is on display here, toned down for the PG-13 rating. Really, what was the purpose of going into a sorority? It's almost bizarre thinking how car chases can be boring. But Chandrasekhar does it, throwing the General Lee, their 1969 Dodge Charger, into all sorts of situations. It flies over streams, police cars, and even a highway. Bo and Luke run from the police, campus police, angry fathers, and more police. Each scene typically unfolds with Bo and Luke causing some trouble, jumping into their car, then Jessica Simpson making an appearance in skimpy clothes. This is lazy filmmaking, plain and simple. The worst aspect of this film is that it fails to show a new generation why people enjoyed the show in the first place. If feels very much like a movie based on something old, rather than a story deserving its own film. The show was mischievous, and fun in a very silly way. The actors look like they're having fun in the movie (Scott did most of his own stunt driving), but they come off as a bit stupid. The basic premise does not age well (moonshine and good ol' Southern fun) resulting in a film that feels very dated. 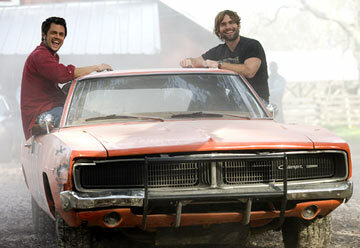 The filmmakers spent so much time focusing on the General Lee and on chases that they failed to bring any emotional substance to the characters. Thus, the fact that Hazzard County may go the way of the show makes no difference, because nobody watching will care. 1 hour, 46 minutes, Rated PG-13 for sexual content, crude and drug-related humor, language, and some comic action violence.